Firstly, apologies for the complete lack of updates, progress reports and news, and also an apology to people who have e-mailed me but not received a reply over the past few weeks, feel free to contact me again and I'll endeavour to respond. As you'll see the website design has been revised and it's appearance updated, I hope you like the more sophisticated look! The Links page has also been updated with some new links. Announcing the version 1.2 upgrade for the Birmingham Cross-City South with new High Detail XP routes, together with a completely revamped class 323 EMU by myself and Steve Green. Cross-City North and Watford Junction to Milton Keynes v2 aren't going to be ready for a while, therefore I'm working on an upgrade to the Cross-City South which will help to make up for the delay in completing my other route projects. All detail levels feature the semi-functional AWS system, new fully authentic flange and track sounds, updated Winter routes and new Autumn routes featuring superb new tree textures by Simon Gathercole, Autumn and Summer rain, together with new 323 wheelslip effects which frequent travellers of the real Cross-City will be familiar with. Photo-realistic skies are featured, the anti-flange squeal sprinkler system installed at Barnt Green is modelled in both the on and off states with track and flange sounds varied accordingly, and new track objects and textures are included, featuring new sleeper and higher resolution ballast textures, along with textured railheads as featured in WJ-MKC v2. Additional lineside features such as foot crossings and signs now also feature, as well as my "alpha bridge shadow" technique which is applied to overbridges along the route. The new High Detail XP routes boast an enhanced and sophisticated catenary system, more lineside details such as pylons, some additional buildings and added station details, 2000m radius curved track objects, and completely new custom built detailed pointwork. More information on the High Detail XP routes can be found below. You can download a 7.6MB preview video showing off some of these new visuals and sounds. Don't forget to turn the volume up during playback! :) The video demonstrates the new "High Detail XP" routes - the normal "High Detail 9x" routes for Windows 9x (i.e. the same "high detail" route files BVE users are familiar with in my existing routes) will not look quite as detailed - please see the Screenshots page for a comparison. Note: If you don't wish to download the video, a collection of screenshots (from within BVE and from within the Track Viewer) is available. These don't all show the same locations as the video. The biggest step forward lies with the new Cross-City South v1.2 High Detail XP routes, which use more than 256 Free Objects so they are only compatible with the latest version 2.5 of Mackoy's superb BVE simulator (High Detail 9x and lower remain BVE 2.4 and earlier compatible). The High Detail XP routes boast an upgraded catenary system with finer scale wires, sophisticated return conductor system, cable interconnects between booster transformers and catenary wires, textured masts giving a 3D appearance, mast identification plates, and concrete bases. Also modelled are catenary anchor spans, and a wider variety of OHLE supports are included. I have also been upgrading the class 323 25kV AC EMU, with help from Steve Green. The new class 323 package will include a revamped cab view featuring a night-time panel with authentic back-lit gauges thanks to cab photos by Steve, and I have created three new passenger views - daytime standing, night-time standing and night-time seated. Cab and passenger view varients feature revamped sound sets, including fully authentic jointed rail and continuous welded rail sounds, with the rail joint sounds calibrated to occur every 60 feet within BVE. Cab and Passenger views both use different run sound sets tailored to where you are located within the coach. High speed and low speed flange sounds are included which are supported in the route files, and new door and horn sounds are featured along with more realistic 3-phase AC motor acceleration sounds. Please note, the High Detail XP routes will only perform well with BVE when running under Windows XP or 2000, on a PC with a ~1GHz processor or faster and a decent graphics card such as the nVIDIA GeForce range or ATi Radeon (the Voodoo5 has been shown to work well with 3Dfx's own Windows 2000 drivers). Attempting to run High Detail XP route files in BVE under Windows 9x or ME may not be a pleasant experience - Windows 9x or ME users will probably have to stick with the traditional High Detail (9x) route files. I have revised the BVE Developer Guidelines after recent consultation with a number of Western BVE developers, and the new guidelines are now published. The revised guidelines take into account not only freeware developers who wish to retain rights over their work and how it is re-used by other people, but also those who prefer to release their work as open source, freely modifiable, or under the terms laid out by the Route Builder Object Library Licence, with the support of the developers of the excellent RouteBuilder program. The guidelines are now more flexible to encourage these differing methods of release, but one important message still remains - if a developer has chosen to retain rights over their work and copyrighted any of their material, then the developer does reserve the right to do this if they so choose, and the final decision a developer takes should be respected - this is what will help to encourage developers to carry on developing after all, which is in the Western BVE communities interests! You can visit the new BVE Developer Guidelines page here, and if you agree with the guidelines and the idea of respecting a developer's wishes, whether they release work as freeware with copyright restrictions, or as open source, etc, then please feel free to add your support to the guidelines that a number of innovative and valuable Western BVE developers already support, when developing your own BVE add-ons. I've decided to include my own seperate collection of BVE objects here at Rail Sim Routes UK. The collection is currently under construction, but when it's ready you'll be able to download the objects and use them without my permission being required so long as I'm credited for them. Unlike my existing objects which have been designed to be used in the circumstances specific to my own routes (such as the removal of one side of an object to improve performance), these objects will offer more flexibility in how they can be used. The only condition on the use of these objects will be the requirement to credit me if you use them. Please note, if you want to use objects or files from within my route downloads, my permission is still required! Now for a quick report on the progress of my other route projects, the Birmingham Cross-City North and Watford Junction to Milton Keynes v2. Cross-City North is still quite a way from being finished I'm afraid, however all trackwork is completed, all overhead electrification up to High Detail XP standards is complete, and the majority of route sounds, basic station infrastructure, major civil engineering features such as bridges and tunnels are also complete. This is nowhere near complete enough for me though. :) The remaining tasks are still major undertakings, namely the construction of Cross-City North specific lineside buildings, and new scenery designed for the Cross-City North. Then there are the detail levels and time of day/weather variations to do as well! Watford Junction to Milton Keynes v2 is relatively advanced, but only the High Detail XP routes are largely completed - the High Detail 9x and lower detail routes have yet to be finalised, pending experiments which aim to find the right balance between acceptable detail on different hardware platforms; a task made considerably harder due to the higher quality track and scenery - it should be remembered that the original WJ-MKC v1.x, despite it's now dated appearance, was behind the scenes almost as detailed and complex as was feasible where performance is concerned, for a route of that length and scope. The new additions to the Cross-City South v1.2 High Detail XP routes are derived from the ideas implemented in WJ-MKC v2, so the XCS v1.2 High Detail XP routes will effectively act as a "testbed" for many of the ideas implemented in WJ-MKC v2, and any feedback concerning X-City South v1.2 will be used in the further development of Watford Junction to Milton Keynes v2. Well over 200,000 unique visitors! Finally, I'm delighted that despite the lack of updates on the site recently, so many of you are still visiting the site - seeing the counter now clock up over 211,000 unique visitors gives some great motivation to carry on developing. Thank you to everyone whose visited the site and taken an interest in the work I'm doing for BVE! The BVE UK Train Collection website is now available again at it's usual URL [www.bvetrains.co.uk], and full service has been resumed. Thank you to everyone for your patience while the site was unavailable, and for making good use of the mirror site which was setup during the outage. Unfortunately the BVE UK Train Collection website is not available at it's usual URL [www.bvetrains.co.uk] at present. It is hoped that normal service will be resumed shortly, however a temporary backup site has been uploaded for the duration of the outage. You can find the temporary site at http://www.bvetrains.fsnet.co.uk. Many train downloads are available on the temporary site, however there are some downloads which are not available yet - this will hopefully be resolved shortly. Robert Glass has just relaunched his superb Scottish Rail Sim Files website, with two new sections added which will be of great interest to BVE users and developers alike. Firstly there's the new Scotrailsim Gallery, where you'll find some mouthwatering screenshots showing off Phase 1 of the Sandymill to Invermay Electricfication project which Robert and myself have been working on, showing off Robert's superb range of enhanced train and scenery objects and textures, amongst other new route developments; as well as the overhead line equipment and updated BR signalling I've installed along the route. Scotrailsim now includes an extensive set of pages explaining and discussing a variety of aspects about BVE and the tools required to develop add-ons for the sim, in the new About section. If you want to learn more about the various tools BVE developers use, such as Mackoy's Track Viewer or Structure Viewer, then this guide is a must read - and if you're a BVE user wishing to explore different ways of enjoying BVE, the guide will be invaluable. Steve Green, together with Robert Raymond (Bluevoss on the CroTrainz forums), have released their amazing Desert Route v3 over at Steve's Train Sim Central. This huge update sees the route upgraded with smooth curves, new signalling, extremely realistic passing train objects, and a variety of route files including new night runs. Also included is the superb Southern Pacific GS-4 steam loco. The route also includes a fantastic signal randomiser program by Bluevoss, which allows varied signalling patterns to be enjoyed. There are some new screenshots showing off my two work in progress routes, available exclusively at Alan Lee's superb www.jubileeline.org.uk website. The screenshots of Watford Junction to Milton Keynes version 2 demonstrate the enhanced catenary installed in the route, as well as the new Dawn and Winter routes - all captured using Mackoy's Track Viewer utility. Likewise, the Cross-City North screenshots show off some of the early details which are being built into the route, such as detailed catenary, stations and buildings. To see these new screenshots, please visit Alan's www.jubileeline.org.uk site, or to find out more about my routes, see my projects page. Staying at the Jubilee Line website, both myself and Steve Green have suplied some images of UK signs and signals for Alan Lee's superb new guide to signalling and trackside signs seen on the UK rail network, and this will be invaluable to those using UK routes routes (such as the Cross-City and Watford Junction to Milton Keynes Central), as many of these real-life signs and signals are used in UK BVE routes. If you've seen a sign or signal in a UK based route and don't know what it means, Alan's Mainline Signals and Signs Guide will be of great use! David White has updated his class 318 25kV AC EMU, with some fantastic new sounds, and an amazing cab rendered entirely in 3D! Visit David's BVE in Glasgow website to download the latest masterpiece from his growing collection of superb BVE trains. An all new version of the class 310 by Steve Green [www.trainsimcentral.co.uk] and myself, has just been released. The unit includes a new full-height and realistic cab, improved sounds, and improved handling characteristics. Steve has also joined Robert Glass [www.scotrailsim.co.uk] and myself at the BVE UK Train Collection website, making his excellent trains available via the collection, so please head over to the BVE UK Train Collection website to download this new unit for BVE. Both Steve and myself hope you enjoy the class 310, and the convenience of having a single source for all our trains! David White, who has built some amazingly realistic scottish EMU's for BVE, has released his latest masterpiece - the Cravens class 311 25kV AC EMU. This unit features a superb photo-realistic cab, and the sounds are simply outstanding! Head on over to David's BVE in Glasgow website to download this superb BVE unit. The BVE UK Train Collection website jointly founded by myself and Robert Glass [Scottish Rail Sim Files] has undergone a huge redesign, and can now be accessed via a new domain name - www.bvetrains.co.uk. Both Robert and myself hope visitors will like the new layout, expanded information about each BVE train, and the ability to browse the site without having to remember long URL's, and without being pestered by pop-up adverts which may have appeared recently, depending on what URL you were using to access the site previously. Enjoy! Also coming soon to the BVE UK Train Collection, is the Freightliner Class 66/5 diesel-electric locomotive, being developed by Shaun Myers. This loco will feature superb sounds, excellent performance characteristics designed exclusively for the latest version of BVE, and a realistic cab created by myself. Keep an eye on the new BVE UK Train Collection site for more details! There are also three new enhanced trains available to download from the BVE UK Train Collection, in the form of 87025 "County of Cheshire", 37906 "Slug 6", and 55019 "Royal Highland Fusileer". These are customised versions of the existing "generic" locos which myself and Paul Robins originally built, which have had their sounds and performance tweaked in an effort to replicate the individual characteristics of the real life locos. These enhancements have been worked on by Wulf, [http://www.zodiac-infosystems.co.uk/rail/bve], and add a touch of variety and realism to the BVE driving experience. Head on over to the new Locomotives section of the BVE UK Train Collection, and using the new menu system click the relevant Loco Class buttons, and then the specific loco sub-menu button to download these new locos. (Note: You can also download the locos from Wulf's Saxon Loco Works site). Once you've installed the new locos, don't forget to navigate to your 'BVE\Trains\' folder and read the various text files within the new train folders, which outline things to look out for when driving the locos, and for details about the improvements they include. Firstly, apologies for the lack of updates to this site, and also for any lack of replies to e-mails over the past month or two. This has been due to myself having a break from BVE development and also where possible, a break from the upkeep of the site. If you have any unanswered e-mails which are important, please get in touch again so I can respond! Announcing Watford Junction to Milton Keynes Central, version 2 - a complete re-write of the original, coded in CSV format with BVE signalling, enhanced scenery, highly accurate catenary and other new features. In it's day, Watford to Milton Keynes was a good route, however it now looks dated compared to more recent routes, not least my own Birmingham X-City. Therefore the route is being upgraded with a variety of new features, and enhancements to existing features. An interesting experiment is being conducted, relating to how complex BVE routes perform under Windows XP compared to Windows 9x, and the results so far have led to a new detail level being introduced! You can download a 5.8MB preview video showing off some of these new features. Please note, the video demonstrates the new "High Detail XP" routes - the normal "High Detail" routes for Windows 9x (i.e. the same "high detail" route files BVE users are familiar with in my existing routes) will not look quite as detailed. Note: If you don't wish to download the video, a small collection of screenshots is available. These do not all show the same locations as the video. Introducing a new detail level - "High Detail XP". Under the Windows XP operating system, experiments with 1GHz Athlon and GeForce cards indicate the old problem of BVE stuttering or pausing when complex objects are loaded is considerably reduced, allowing the "High Detail XP" routes to feature more detailed objects. With this detail level for example, the bitmaps currently used to represent lengths of overhead wiring have been replaced with true 3D models without any stuttering or framerate loss occuring within BVE. So far, overhead wire objects with up to 600 vertices have worked without incident! The final route will include wire objects with fewer vertices however. For the XP user, this means the "High Detail XP" routes will offer higher quality catenary, more trees, and more richly detailed scenery. All new track objects and textures, with realistic 3D rails and British outline sleepers. Also includes higher resolution ballast textures. Adjusted curve radii to aid realism at higher speeds. The cant has also been adjusted on many curves to increase realism. Smooth curves throughout, including pointwork with point motors as in the Cross-City South. More rich scenery, with many more trees** and refined textures. All new Winter tree bitmaps are provided, courtesy of the very talented Simon Gathercole. These new textures enhance the Winter routes considerably! Simon has also improved the appearance of the Summer tree textures. New Winter textures, with much better looking snow lying on the track. New MkI catenary system, as good as if not better than the catenary included with the Cross-City South**. Includes 3D effect registration arms, true zig-zagging of wires throughout the route, "point to point" wiring, truly accurate overlaps, and booster transformer gantries. Previously missing and incorrect bridges have been added or corrected. Full conversion to CSV format, complete with proper BVE signalling, making use of .Pretrain commands. Updated passing trains sounds, with some new samples added. New Dawn and Night variations. ** Only the "High Detail XP" routes, designed for BVE running under Windows XP, feature the maximum number of trees, and the highest level of catenary detail. The "normal" Windows 9x High Detail routes will feature less detail to ensure acceptable performance. Exactly which details will be included, and what level of complexity they will retain, hasn't been decided yet - this will depend entirely on how well the routes perform under Windows 9x with various details enabled or disabled. Amazing new Track Viewer utility from Mackoy! Mackoy has just released a truly fantastic utility for BVE, which will transform the way you look at your favourite routes! The all new "Track Viewer" program, which allows you to view a BVE route using a freely moveable camera, will let you to see routes from any angle you wish - simply stunning, and it shows some great potential for the future of BVE! Also, Mackoy has released an update to his Structure Viewer program, which allows much finer control over the viewing of BVE objects than the previous version. You can find these two gems on Mackoy's Official BVE Website. For help with using the new Track Viewer, please read the this thread on the TrainsimUK/Crotrainz forum. Matt Starkie, well known for his superb "HST Scream" sound samples in use with Steve Green's HST, has been busy producing some excellent route guides for BVE. Each guide is in HTML format, and includes the mileages of signals, landmarks, tunnels, junctions and so-on. Designed to Railtrack standards, these guides will enhance your BVE route driving experience by allowing far more realistic route learning to take place, thereby and giving you a greater knowledge of the routes you're driving. Visit Matt's new Rail by Rail site, to download route guides for several popular BVE routes. The collection will also expand even further! Quite a number of e-mails are received here at Rail Sim Routes UK from newcomers to BVE, who are unsure about what BVE actually is, or who have trouble finding and downloading the program; therefore I've launched my own "BVE Information and Help" pages, to guide newcomers to this site through the downloading and installation of the essential BVE files required in order to use my own routes, as well as instructions on using different trains with routes. You can read through the new guide here. Fancy yourself as a respected BVE developer? How to do it properly! There has been much debate and argument recently within the Western BVE community, concerning copyright, use and/or modification of files without permission, and the problems surrounding these issues. Some of these problems may well be attributable to a lack of knowledge about how the Western BVE community works, or through just not realising that free downloads are subject to copyright just like any other intellectual property. When a route or train developers' work is taken and used without permission, it shows a lack of respect for that author's work, and the author's themselves - and this leads to resentment which in totally unnecessary and avoidable. It also leads to new up and coming BVE developers potentially landing themselves in hot water because they don't realise that it's both wrong and unfair to use another person's work without asking or consulting original authors first. Therefore, I have launched a new set of guidelines for new or would be BVE developers, which if followed, will ensure that no existing developers will be offended through misuse of their work by accident, and will help new developers to enter the BVE community on the right note. These guidelines have received the backing of a couple of prominent members of the Western BVE developer community, and you can read the new guidelines here. Despite the break from BVE development, and subsequent upgrade of WJ-MKC, significant progress on the Cross-City North has been made since it was announced. Currently, almost all track is laid and finalised. All electrification work has been completed, although certain aspects need to be re-coded to make more Freeobj commands available. Around 50% of the scenery is now complete, with trees, textures and landscaping added in. All bridges encountered along the line have been finished and added to the route, and work on station buildings has been started. Such details as mileposts are now included, many of the route's sound effects have been implemented, and accurate gradients will be implemented next. And finally... Over 100,000 unique visitors to the site! Last month, the counter clocked up it's 100,000th unique visitor! 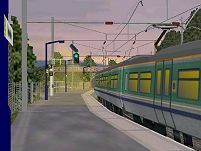 Thank you to everyone who has visited the site since it was launched in 2001 as a site purely dedicated to the Watford Junction to Milton Keynes Central BVE route, with the subsequent transformation into Rail Sim Routes UK with the addition of BVE trains, the BVETSS homepage, and not least the Birmingham Cross-City series of routes. Your support is appreciated! Updates for Classes 220 "Voyager" and 221 "Super Voyager"
John Owen [http://brsounds.cjb.net] has recorded some excellent new and realistic engine and door sounds for Ben Martill's Class 220 "Voyager" and Bryan Dudley's class 221 "Super Voyager", both available from the BVE UK Train Collection. With John's invaluable assistance, I have also updated the Train.dat files to offer a more realistic playback of the two DEMU's engine sounds. The two updated trains now sound more realistic, and you can download these two gems from the BVE UK Train Collection site. Edited at 18:50 - If you downloaded the Voyager or Super Voyager prior to 18:50 this evening, could you please download the two files again, as I mistakenly included the wrong sound samples in both downloads. My sincerest apologies for any inconvenience this may have caused. I have also updated the Links page, you can find a couple of excellent new sites there, including the new Fast E-Rail and Merseyrail Project sites. Don Clarke has upgraded his fantastic Edinburgh to Dundee route and 2x37 locos to make use of the BVE Track Sound Standard [BVETSS]. New track sounds are added for the under and overbridges along the route, and now any BVETSS compatible train can be used with Don's Edinburgh to Dundee route, and you'll still here these new, more relaistic sound effects. Head over to Don's site [http://gotopcs.net] to download the latest update to this BVE masterpiece. Note: Route shown in early stages of development - appearance will be improved as progress is made As visitors may have noticed from the homepage, the site has now been updated with details about my next forthcoming route for BVE - the Birmingham Cross-City North from New Street station to Lichfield Trent Valley High Level. A follow-up to the successful Cross-City South, the highlights of this BVE route will undoubtably be the complex trackwork around New Street station, Proof House Junction, and from there to Aston where the Cross-City North diverges from the Birmingham - Walsall line, and passes beneath the infamous "Spaghetti Junction". Complex scenery and lineside features are being included, like the Lawley Street Freightliner terminal, "Spaghetti Junction", and the multi-level Lichfield Trent Valley station, where the Cross-City line passes directly above the Low Level platforms on the busy 4 track Trent Valley section of West Coast Main Line. All new and highly detailed and accurate MkI catenary will be included, increasing the level of complexity achieved in the Cross-City South and far surpassing what was achieved with Watford Junction to Milton Keynes... Visit the new Cross-City North section of the site for more details, which will be added to as and when progress is made. Those who follow the BVE section of the Crotrainz Forum regularly, will know that a class 357 "Electrostar" EMU has been in development by ROBsLab for some time. After much hard work, the class 357 is now completed, and can be downloaded from the new Unofficial c2c Website - http://www.c2crail.cjb.net/. The unit features excellent motor sounds, with several custom sound recordings to make the unit more realistic and a pleasure to drive. Several WJ-MKC and X-City route files are also available on Rail Sim Routes UK, for the 357 to run on. They can be found here. The 357 is also BVETSS compliant, so the unit can be run on any BVETSS compatible route while having the correct track sounds retained. Robert Glasshas just completed the conversion of his Sandymill to Invermay routes and Class 158 over to the new BVE Track Sound Standard [BVETSS], which now means that these BVE add-ons on Robert's site are now fully comptible with the routes and trains available on this site and Steve's Train Sim Central. As a result of the BVETSS updates, Robert has added in passing train sound support to Sandymill - Invermay and the class 158, so please visit Robert's Scottish Rail Sim Files to download the latest updates, which make these already excellent BVE add-ons even better! James Withers has very kindly given me permission to host his ECML Class 91 electric loco and Class 313 EMU in the BVE UK Train Collection, as unfortunately James' ECML site [http://www.ecml.freeserve.co.uk] is not available at present. I've also updated the trains to comply with the BVETSS standard, and these two trains can be downloaded from the BVE UK Train Collection. I've also received the go ahead to update the class 91 panel to include a full height variation, which I will undertake shortly. Bryan Dudley has just completed a superb new train for BVE, the new Virgin Trains Cross-Country Class 221 "Super Voyager" 125mph tilting DEMU. Owing to bandwidth problems at Bryan's Railtech site, by agreement between Bryan and myself the new Super Voyager is now available within the BVE UK Train Collection for all BVE users to enjoy. The Super Voyager features new cab lighting effects, and you can see these in effect when the train doors open or close. The class 221 is a tilting unit, therefore Bryan has also included clear and detailed instructions on how to easily enable tilt on routes where the 221 is used, please see "Readme.doc" after installation. The Super Voyager is BVETSS compliant, therefore you should download the BVETSS compliant versions of any route if available, before using the 221. Please see the previous news item dated 5th June for details on the BVETSS updates within the BVE community, and visit the BVE Track Sound Standard page for more details. For some time now, the experience of using main line BVE trains on routes they weren't specifically designed to run on, has been flawed in one serious way - the track sounds which are played are often incorrect because the non-default trains include track sounds configured for running on a "default" route instead; unfortunately most BVE routes and/or trains don't have their track sounds configured in the same way, hence the problem. To try and solve this issue, with the help of Steve Green [Train Sim Central] I have formed a new "BVE Track Sound Standard" [BVETSS], a clearly defined list of preferred track running sounds which main line routes and trains should use. If and when the BVETSS is widely adopted, then any BVETSS compliant train will be fully compatible with any BVETSS compliant route, and this will allow main line routes and trains to be experienced as their designers intended, regardless of the route and train combination being run. Several BVE developers have already shown support for BVETSS, or have agreed to start creating BVETSS compliant routes and trains. If you're a BVE route or train developer, why not visit the BVE Track Sound Standard page and consider adopting the standard for your own BVE add-ons, and display the BVETSS Compliant GIF's and links to indicate your routes and trains are compatible with some of the best Western BVE add-ons available? At the same time, you would be promoting the BVETSS and encouraging others to adopt the standard when designing BVE add-ons. The Watford Junction to Milton Keynes route, and all the trains available within the BVE UK Train Collection, have been updated to take advantage of the new BVE Track Sound Standard; and as such the relevant files should be downloaded again to ensure you have the latest BVETSS compliant versions of all these BVE add-ons. I have also added in the "engine fade in/out effects" which Steve Green used in his HST and 170, to all the locomotives inlcuded in the BVE UK Train Collection, to enhance the sounds. Please note the Birmingham X-City South Route is already BVETSS compliant, and doesn't need to be downloaded again. Don't forget you need the new Class 87 and 310 as well! The main line routes and trains available on Steve Green's Train Sim Central have been updated to become BVETSS compliant; and the main line routes and trains on Robert Glass' Scottish Rail Sim Files are also being updated - and for the first time all the main line routes and trains on our sites will be fully compatible with each other. I've been lucky enough to receive some excellent digital AWS sound samples from John Owen [http://centralsim.tripod.com], and I'm pleased to announce that these are freely available for all BVE route developers to use in their own routes; just remember to credit John for the sounds! You can find these new samples in the new BVE Sound Samples section of this site. I have also updated the Birmingham Cross-City South to make use of these files, however if you have already downloaded the route you can download a small patch here: X-City Digital AWS Patch. Finally, readers of the BVE section of the CroTrainz forum will be aware of the plans to standardise the track running sounds on main line BVE routes and trains, in an effort to put an end to incorrect track sounds being played on non-default route/train combinations; I will be announcing more details about this initiative hopefully sometime during the coming week, when at the same time all the route and train downloads on this site will be updated to comply with the new standards. The plan has already received more widespread approval, and several BVE route and trains developers are already in agreement with the idea and prepared to support the initiative. The updates will also include some enhancements to the sounds of the trains in the BVE UK Train Collection. Robert Glass has just released an excellent update to the class 158 "Express" DMU, and he has drawn a superb and completely revamped full height, animated panel complete with moving power/brake handles and headlight status indicators. John Owen has also supplied some new sounds for the class 158, and as we've come to expect from John these are excellent, and really add to the realism of driving the unit. The new class 158 can be downloaded from the Trains section of Scottish Rail Sim Files. The complete Circle Line by Paul Jobber has also just been released over at Steve Green's Train Sim Central, and this LUL route is simply stunning. The quanity and quality of lineside and station details is impressive, and the new full-height, animated cab found in the updated "C" Stock train combine to make this a superb route to drive. I'd thoroughly receommend it! Steve Green has also released a new version of the class 170 "Turbostar" complete with a superb full height animated cab and more of John Owen's superb sound samples, as well as a great new class 319 EMU, available in both AC and DC versions - why not try the AC version of the 319 on my own Watford Junction to Milton Keynes Central route? I'm pleased to announce that Chris Cooper has finished an update to the Class 303 25kV AC EMU, and the unit now features brand new authentic sound samples kindly supplied by John and Peter Douglas, including new door opening and closing samples, ambient background sounds, and "screeching" effects when the brakes are applied hard. Chris has also added in a functional Line Volts indicator light, like that featured on the Class 323. To see this in effect, you need to press the "/" key while a route using the 303 is loading, to have the indicator light off when the route starts. When the brakes are placed in the "EB" position, the light will illuminate. Please download the new 303 from the BVE UK Train Collection. Also keep an eye out for Chris' new Class 90 AC electric loco, Mk3 DVT (Driving Van Trailer), and an updated Class 325 Dual Voltage Postal Unit - all coming to the BVE UK Train Collection in the not too distant future! I have also updated the Links page recently, and you can find new links to several BVE and railway sites. Much of the feedback so far, has also revealed that the hardware requirements I indicated for the route are a little overstated, therefore if you're concerned that a particular detail level won't function on your machine, don't be afraid to try the higher detail levels as they do seem to work on even some lower spec. machines. Much to my suprise!